It’s a good morning for fans of Peter Jackson and The Hobbit film series. Warner Bros. has always been sneaky good about marketing flicks based on J. R. R. Tolkien novels and The Hobbit: An Unexpected Journey has proved to be no exception. The film has been available on Blu-ray and DVD since March, and while the sets boasted the theatrical edition of the film and some interesting extras, there was no mention at the time of an extended edition. On Wednesday, Warner Bros. Home Entertainment announced that The Hobbit: An Unexpected Journey Extended Edition will be available on Blu-ray 3D, Blu-ray and DVD on November 5. Additionally, if you’d like to get your hands on the Extended Edition just a wee bit earlier, the set will be available for Digital Download starting on October 22. Honestly, the length of the Extended Edition isn’t as exciting as you would guess. The movie has only been physically lengthened by 13 minutes, which is enough for several scenes, but isn’t all that much when compared to some of the extended sets for the Lord of the Rings movies. For instance, the regular widescreen edition of The Return of the King is only 200 minutes, while the Extended Edition is actually a whopping 250 minutes. The Hobbit is a much shorter novel to split into three movies, so it makes sense that there would be less extra footage; however, it also makes the Extended Edition less of a must-have. Thus, the big bonuses with purchasing The Hobbit: An Unexpected Journey Extended Edition are the brand new cover art and the extras that will be a part of the set. Let’s take a look at the cover art, first. 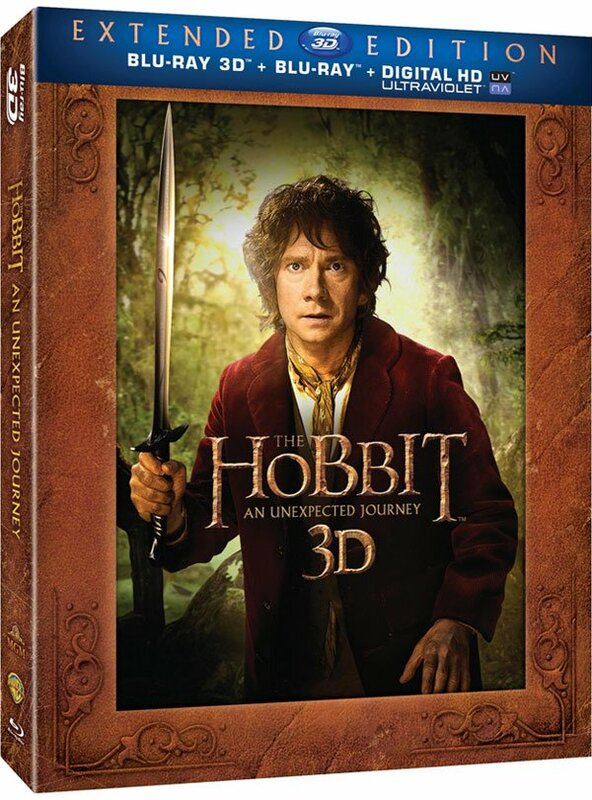 I’m not sure I love Bilbo’s (Martin Freeman) wide-eyed look on the cover, but I do appreciate the intricate, almost leather-looking stuff at the edges of the Blu-ray 3D copy. It makes the movie look more expensive, and it will be, but only a little bit. The list price for Blu-ray 3D copies is $54.98, while for Blu-ray copies it is $35.99 and for DVD copies it is $34.99. Each copy will also offer slightly different cover art. When we first reviewed the movie’s initial home entertainment release, we heard comments from people who didn’t want the “barebones” DVD release. The Extended Edition will boast over 9 hours of bonus features, which seems to be where buyers will get their money’s worth, since the actual footage of the film is not all that much longer. Warner Bros. is currently listing only three exclusive extras with the set, but one will be a “chronological history of the filming of The Hobbit: An Unexpected Journey.” That lengthy extra is basically a giant making-of segment looking at all of the minutiae of putting together a film as large and epic as An Unexpected Journey turned out to be. You can check out the full list of extras, below, or pre-order any of the sets over at Amazon. It’s also worth noting that the second film in the trilogy, The Desolation of Smaug, will open just a few weeks after The Hobbit: An Unexpected Journey Extended Edition release, on December 13.